Everybody likes to dress up for Halloween. But nobody loves Halloween more than the LGBT community where, as some like to joke, Oct. 31 is more than just an excuse for a party, it’s a high holy day. 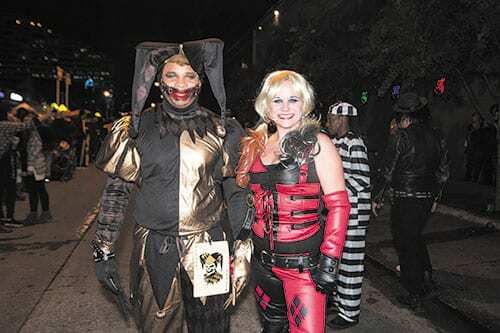 Nowhere will you find costumes more glamorous, more creative, more humorous or more topical than the Halloween Block Party on Cedar Springs Road. And according to a press release this week from Lyft, all of Dallas knows that. 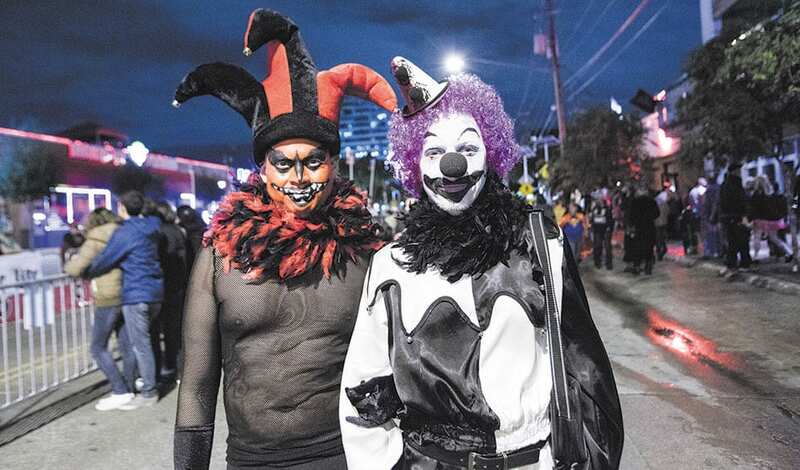 Lyft has compiled a list of the Top 15 Halloween Weekend Destinations in Dallas — and five of them are LGBT nightclubs. In fact, the top two and four of the top six are LGBT bars. The are Station 4 (S4/The Rose Room) at No. 1, Round-Up Saloon at No. 2, JR.’s at No. 3 and Sue Ellen’s at No. 6. The Dallas Eagle came in at No. 13. Each year, Caven Enterprises — the company that owns S4, JR.’s, Sue Ellen’s and TMC: The Mining Company — sponsors the Halloween Block Party each year, and this year is no exception. This year the street closes at 6 p.m., and the party starts at 7 p.m. The event will feature a catwalk down the middle of the road in the 3900 block of Cedar Springs, with an emcee on hand to critique the costumes of those who walk. The parking lot behind S4 will be roped off for more party space, as well the parking lot in front of Alexandre’s in the 4000 block of Cedar Springs. There will be live DJs in both parking lots, and food and beverages available at seven different booths spread around the street and parking lots. There will also be a food truck in the back parking lot. The Rose Room cast will put on a special Halloween show in the back parking lot at 9 p.m. on Saturday, along with their regular 11 p.m. show in the Rose Room. All of the bars will be open to those 21 and older, but the street party and both parking lots will be free and open to all ages. While the Block Party is one of the biggest Halloween parties in North Texas, it isn’t the only one. LGBT bars in Dallas, Fort Worth and Arlington have special events planned through Halloween night on Wednesday, Oct. 31. • 1851 Club in Arlington will have Halloween-themed drag shows both Friday and Saturday night this weekend, starting each night at 10:30 p.m. and featuring special performances. Saturday night will include a costume contest with cash prizes after the show, along with various drink specials all night long. The club is open to those 21 and up with no cover. • 515 Bar in Fort Worth, will host a Halloween Costume Party on Friday night, from 10 p.m.-1 a.m.
• All four Caven Bars — JR.’s, S4, Sue Ellen’s and TMC: The Mining Company — will hold costume contests at 11 p.m. on Halloween night, and the finalists from each bar then go to S4 to compete for more than $1,000 in cash and prizes. • Cedar Springs Tap House, 4123 Cedar Springs Road, holds Halloween Scaryoke from 8-10 p.m. on Wednesday, Halloween night. • Club Changes in Fort Worth celebrates Halloween on Friday night, Oct. 26, with the Divine Miss Divas: Horror Story show at 10 p.m., followed by a costume contest, with a $100 cash prize, at 11:50 p.m.
• Dallas Eagle hosts the Dead Celebrities Halloween Costume Party on Saturday from 10 p.m.-2 a.m. On Halloween night, the Eagle hosts an American Horror Story: Apocalypse watch party at 9 p.m.
• Déjà vu in Dallas hosts the The Masked Truth Costume Party and Contest: Halloween The Return of Horror Fest, hosted by Miss Wanda at 11:30 p.m. Sunday. The winner receives a $500 cash prize. • Grapevine Bar holds its annual costume contest on Halloween night, with gift cards for the first, second and third place winners. • Havana hosts its Havanaween party on Wednesday, featuring a costume contest with a $500 prize for the winner. • Henry’s Tavern in Plano holds a Halloween Costume Contest Saturday night, from 10 p.m.-1:30 p.m.
• Hidden Door holds its annual Halloween party Saturday night, with a costume contest starting at 11 p.m. There will a $150 cash prize each for Best Costume, Most Outrageous Costume and Best Couple or Group. • Liquid Zoo Bar & Grill holds its Halloween Costume Party Saturday night, from 10 p.m.-2 a.m., with a cash prize for the winner. • Pekers holds its Halloween Karaoke and a costume contest, with a $100 prize on Saturday night, from 9:30 p.m.-2 a.m.
• The Round-Up Saloon celebrates the Block Party on Saturday night, then holds its annual costume contest at midnight on Wednesday, Halloween night, with cash prizes for the best individual costume and the best group costume. • Station 4 holds its preliminary costume contest at 11 p.m. on Halloween night, then hosts the costume contest finale featuring winners from all four Caven bars. Cassie Nova, Jenna Skyy, Asia O’Hara, Krystal Summers, Sasha and Kelexis Davenport present a special Halloween show Wednesday night in the Rose Room. • Sue Ellen’s will feature a performance Saturday night by the Gawd Almighties, then on Halloween night, DJ Sno White spins from 9 p.m.-2 a.m. The bar also holds a costume contest at 11 p.m.
• Woody’s holds its 10th Annual Halloween Backlot Party from 7 p.m.-2 a.m. Saturday night, hosted by Jada Pinkett Fox. On Halloween night, the bar hosts Gloria’s Divine Halloween Karaoke at 10 p.m.